(16/44) TRENTON – Island Beach State Park, one of the most popular destinations in the New Jersey State Park System, will kick off its summer event season by partnering with the New Jersey Sea Grant Consortium in hosting a free Ocean Fun Day on Saturday, May 21. The annual event, geared to families and nature lovers, will offer eco-tours of the island, a host of hands-on activities, educational displays, a variety of classes, and exhibits that celebrate the natural wonders of the Jersey Shore. 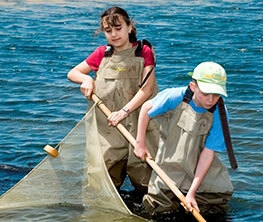 The goal of the Ocean Fun Day is to raise awareness of the need to protect coastal resources in a fun and hands-on way. The event runs from 11 a.m. to 3 p.m.
A record number of exhibitors have committed to be a part of this year’s Ocean Fun Day. Events offered this year include coastal crafts, fiddler crab races, eco-tours, workshops, using seins to net fish and other aquatic life, an energy scavenger hunt, games and prizes, youth fishing clinics, Beachcombing 101, face painting, and sea-creature touch tanks and exhibits. A second Ocean Fun Day is planned for Sunday, May 22, at the New Jersey Sea Grant Consortium’s facilities on Sandy Hook. This event will also run from 11 a.m. to 3 p.m. Visitors will have an opportunity to visit the National Oceanic and Atmospheric Administration’s marine lab. The events will also feature a “Picture This” photo and caption contest, open to students in grades 3 through 5 and grades 6 through 8. The students are asked to depict how they conserve energy and natural resources. At either event, visitors can vote on their favorite photo. The winners will receive field trips for their entire class to either Island Beach State Park or Sandy Hook. Partners in Ocean Fun Day include founding sponsor New Jersey Natural Gas, the Asbury Park Press, the National Oceanic and Atmospheric Administration and the DEP’s Division of Parks and Forestry. “Each year we look forward to partnering with NJDEP and the staff at Island Beach State Park to host this event. They are truly committed to our state's incredible shoreline and share with us the importance of educating the public about its sustainable use and care,” said Claire Antonucci, Executive Director of New Jersey Sea Grant Consortium. Visitors coming on Saturday to Island Beach State Park for Ocean Fun Day are directed to go to Ocean Bathing Area 1, which is about four miles past the park’s gatehouse. Shaped by storms and tides, Island Beach State Park is one of the few remaining undeveloped barrier beaches on the north Atlantic coast. The park encompasses about 3,000 acres of beaches, dunes, maritime forests, freshwater wetlands and tidal marshes. It is home to the state’s largest osprey colony, as well as peregrine falcons, wading birds, shorebirds, waterfowl and songbirds. The events will be held rain or shine. Take GSP to exit 82. Follow Route 37 east to Route 35 south to park entrance. Once you enter the park follow the Ocean Fun Days signs. Use Exit 117. Take Route 36 east. Follow signs to the Sandy Hook Unit of Gateway National Recreational Area, approximately 12 miles. Once you enter the park follow the Ocean Fun Days signs to the New Jersey Sea Grant Consortium’s headquarters at 22 Magruder Road, within the Fort Hancock Historic District. Use Exit 105. Take Route 36 east, approximately 6 miles. At the intersection of Ocean Boulevard, turn left (north). Continue on Ocean Boulevard for approximately 8 miles.